Seventeen university students sit in a café in Kaslik, a coastal town half an hour’s drive north of Beirut. Ten boys and seven girls, all sucking on water pipes – waiters wade through a thin but unmistakable pool of smoke in the air. This is the new face of youth smoking in Lebanon and indeed across the Middle East. It’s more girls, it’s more smoke and sadly, in Lebanon, it’s still indoors. More young people smoke water pipes in Lebanon than perhaps anywhere else on earth and in 2011, the government moved to ban smoking indoors as part of Law 174. But the tobacco and restaurant industry mustered a campaign many believe was highly and typically misleading that wound back the public smoking ban earlier this year. The consequence of this is young Lebanese have been left with policies that fail to decrease their risk of smoking at a time when the behaviour of smokers are changing, perhaps for the worse. “When it comes to water pipes we’re talking about almost the same toxins, the same cancerous agents, just in greater volumes,” says Associate Professor Rima Nakkash of the American University of Beirut. Nakkash helped shape Law 174, which included three main strategies, or “pillars”, to help reduce smoking rates in the Lebanese population. She isn’t optimistic about the prospect of reversing the U-turn the government has made on smoking in public places. Lebanon’s young people have a particular taste for water pipes, also known as hookah or shisha. 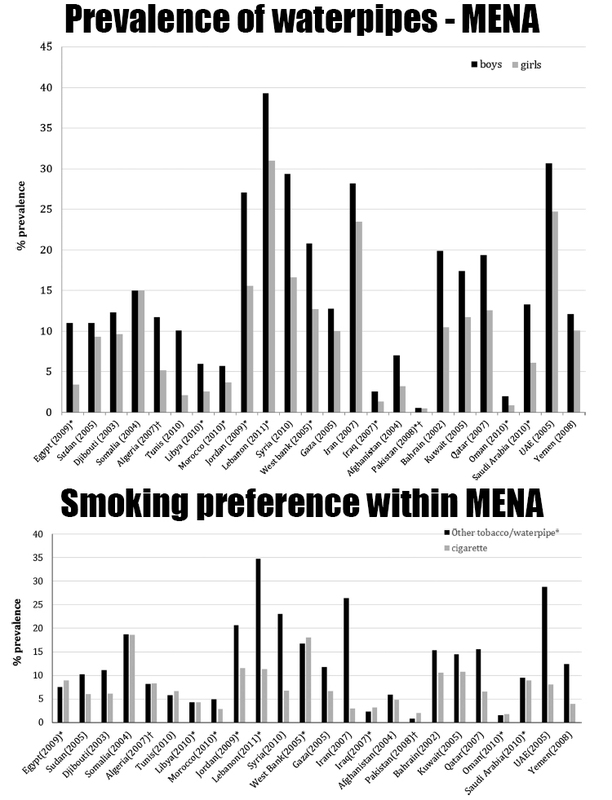 As these graphs from peer review journal Tobacco Control clearly show, more Lebanese boys and girls smoke waterpipes than all other young people in the Middle East except boys from the UAE. They only equal Lebanon’s girls. Further, the extent of the preference amongst young people for water pipes over cigarettes is larger than anywhere else in the region. Global water pipe smoking data is sketchy because it’s only come back into fashion in the last decade or so. However, given the practice is clearly most popular in the east Mediterranean, it looks likely more young Lebanese smoke water pipes than any country in the world. And the World Health Organisation is concerned water pipe smoking could be working as a gateway to cigarette smoking as well as a false ‘halfway house’ between smoking cigarettes and quitting – cigarette smokers use water pipes as a strategy for quitting, only to go back to cigarettes. The restaurant syndicate argued, amongst other things, that hookah is a rich part of Lebanese culture and the ban on smoking in public areas would hurt their revenue. Researchers counter that hookah only came back in the last decade, which is why they don’t have a handle on precisely how damaging it is to the user’s health. The World Health Organisation also laments that research on the precise health impacts of water pipe smoking against cigarette smoking remains patchy. But it also stresses, “every study to date has found that waterpipe tobacco smoke contains ample quantities of toxicants known to cause diseases in cigarette smokers, including cancer”. Additionally, anti-tobacco campaigners point out the predictions of massive losses in revenue from the hospitality sector due to a public smoking ban had no international examples to back them up. While anti-smoking advocates have universally received the public smoking ban U-turn as a big defeat for the cause, Law 174 had two more of three “pillars” that are still standing. The first of the other two is better health warnings for tobacco products. Lebanon’s cigarette packets now have bigger textual warnings on them. Unfortunately this doesn’t apply to hookah in Lebanon. Turkey, for example, has extended the warning labels to the water pipe bottles. The second is an advertising ban, which has been well monitored by the Consumer Protection Office, according to Nakkash. However, she adds the tobacco companies consistently try to undermine the laws with ‘selling’ campaigns, instead of classic marketing or promotional campaigns. This tendency by the tobacco companies to ignore or undermine Lebanese legislation goes back to the early 1970s. Indeed the tobacco industry’s behaviour worldwide shows any additional steps Lebanon might take in the future to drive down smoking rates will probably be met with stiff resistance. The next international frontier against smoking is not just bigger warnings on cigarette packets, which Lebanon has, as well as graphic pictures of the consequences of smoking, but neutralising the branding of the cigarettes themselves. It’s called plain packaging. Nakkash acknowledged plain packaging is world’s best practice, but she says the political and social conditions within Lebanon mean it’s unrealistic to push for plain packaging straight away. A gradual improvement in standards for packaged cigarettes is an acceptable strategy. Indeed, given the speed with which the public smoking ban was overturned, such an approach is probably necessary. Australia has successfully legislated plain packaging and other countries in the Americas and Europe are expected to follow. However, the tobacco industry launched court action in Australia that involved some strange legal manoeuvres. Phillip Morris comprehensively lost that court case, but Nakkash doesn’t expect the industry to heed any lessons from that it when other countries push for plain packaging. As the students in the Kaslik café continue to pass around the water pipe, Lebanese Streets asked the owner whether he was aware of the complex, international battles going on over tobacco consumption of cigarettes and water pipes. Posted in: Cigarette Type, Lebanon, Smoking Ban.